One work within the Monastery's main church (Katholikon), decorating the sanctuary apse, is particularly notable. Christ is portrayed with black hair and beard in an oval "glory" between Moses and Elijah who represent the Law and the prophets. Below, the three awed disciples are pictured in different poses. The soffit of the triumphal arch is decorated with medallions containing busts of the twelve Apostles. 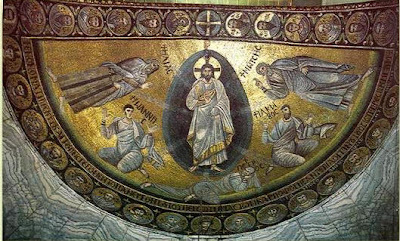 The three Apostles included in the scene fo the Transfiguration have been replaced in the chain of medallions by Paul, Thaddaeus and Matthias. The base of the apse is bordered by another series of fifteen medallions with busts of the Prophets. 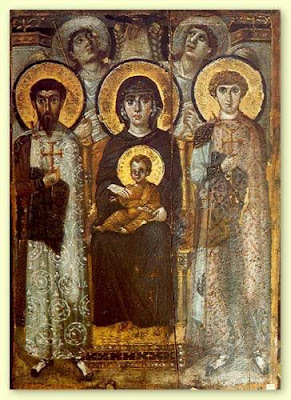 This monumental composition of the late 6th century is a true masterpiece of Byzantine art. Through the subject, treated with intense light and profound spirituality, the mosaicist has succeeded to represent in a most expressive and transcendental manner the doctrine of the two natures of Christ, as formulated in 451 AD by the Ecumenical Council of Chalcedon. The terminal medallions enclose the portraits of Longinus the Abbot (right) and John the Deacon (left). Both were important personalities. Longinus was Abbot of the Monastery between 562-565/6, at which time the decoration was executed. He later became Patriarch of Antioch. 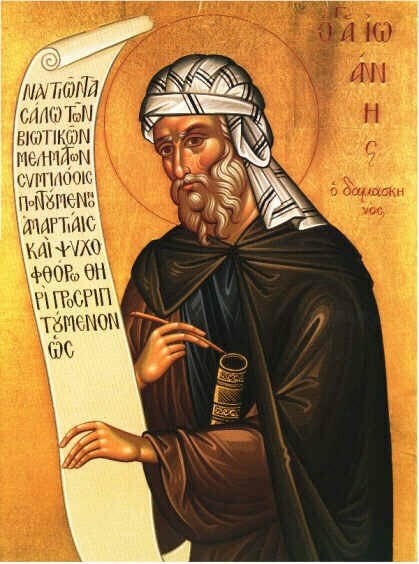 John is perhaps the later Patriarch of Jerusalem known as John IV (575-594). The spandrels of the arch are occupied by two flying angles and the center by the Amnos (Lamb). The Virgin is depicted in bust on the south side and St. John the Baptist on the north. We may say that we have here one of the earliest representations of the Deesis. The upper part of the wall shows two episodes from the Old Testament. They are Moses before the Burning Bush and Moses receiving the Tablets of Law. This superb mosaic must have been made by master mosaicists who had come from Constantinople. Cleaning and conservation operations, undertaken in 1958 by American experts, revealed the brightness and delicacy of the colors, the lively treatment of the subject and the excellent quality of this unique work of art. Because of the sanctity and spirituality of the site and the famous mosaic of the Transfiguration, the Monastery's church (Katholikon) became known with the passing of centuries as "Church of the Transfiguration of Christ the Savior". To this day it is known under this name, in addition to the original name in honor of the Virgin of the Burning Bush and the later one in honor of St. Catherine.